Testing is usually the most expensive, time-consuming and difficult activity during the development of engineering products and systems. Development testing must be performed to ensure that designs meet requirements for performance, safety, durability, reliability, statutory aspects, etc. Most manufactured items must be tested to ensure that they are correctly made. However, much of the testing that is performed in industry is based upon traditions, standards and procedures that do not provide the optimum balance of assurance versus cost and time. There is often pressure to reduce testing because of the high costs involved, without appreciation of the effects on performance, reliability. etc. Misperceptions are commonplace, particularly the idea that tests should not stress products in excess of their operating levels. The main reason for this situation seems to be that engineers have not developed a consistent philosophy and methodology for testing. Testing is seldom taught as part of engineering curricula, and there are no books on the subject. Specialist areas are taught, for example fatigue testing to mechanical engineers and digital device testing to electronics engineers. However, a wide range is untaught, particularly multidisciplinary and systems aspects. Testing is not just an engineering issue. Because of the importance and magnitude of the economic and business aspects testing is an issue for management. Testing is perceived as a high cost activity, when it should be considered as a value-adding process. The objective of this book is, therefore, to propose a philosophy of engineering test and to describe the necessary technologies and methods that will provide a foundation for all plans, methods and decisions related to testing of engineered products and systems. The book will help those who must manage and conduct this most difficult and uncertain task. It will also provide a text which can be used as the basis for teaching the principles of testing to all engineering students. Testing is the most expensive, time-consuming and difficult activity in the development of engineering products and systems. Many industrial testing practices are based upon traditional standards and procedures that fail to provide the optimum balance of assurance versus cost and time. Presenting a consistent philosophy of test engineering, this book is the first of its kind to describe the broad spectrum of modern methods and technologies. 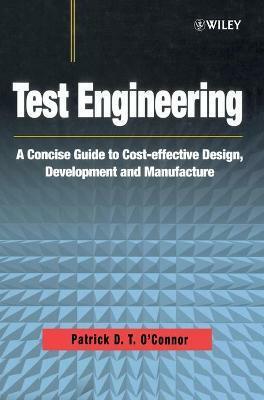 This valuable reference will aid engineers who must manage and conduct the difficult and uncertain tasks of testing new designs and products. The unique and readable style makes this an indispensable text for all engineering students. * A multi-disciplinary approach to test engineering including test economics and management. * Practical, concise descriptions of the methods and technologies in modern mechanical, electronics and software testing, including accelerated test. * Insights into the developing interface between modern design analysis methods and testing practice. * An explanation of why products and systems fail, which testing methods are appropriate to each stage of the product life cycle and how testing can reduce failures. * An overview of international testing regulations and standards. Preface. Series Foreword. Introduction. Stress, Strength and Failure of Materials. Electrical and Electronics Stress, Strength and Failure. Variation and Reliability. Design Analysis. Development Testing Principles. Materials and Systems Testing. Testing Electronics. Software. Manufacturing Test. Testing in Service. Data Collection and Analysis. Laws, Regulations and Standards. Management. Appendix 1: Acronyms. Appendix 2: Testing Regulations and Standards. Appendix 3: Development Test Plan Example. Appendix 4: Production Test Plan Example. Index. Patrick O'Connor received his engineering training at the Royal Air Force Technical College. He served for 16 years in the RAF Engineer Branch, including tours on aircraft maintenance and in the Reliability and Maintainability office of the Ministry of Defence (Air). He joined British Aerospace Dynamics in 1975, and was appointed Reliability Manager in 1980. In March 1993 he joined British Rail Research as Reliability Manager. Since 1995 he has worked as an independent consultant on engineering management, reliability, quality and safety. Mr. O'Connor is the author of "Practical Reliability Engineering," published by John Wiley (3rd. edition 1995). He is also the author of the chapter on reliability and quality engineering in the Academic Press Encyclopaedia of Physical Science and Technology, and until 1999 was the UK editor of the Wiley journal "Quality and Reliability Engineering International." He is editor of the Wiley book series in quality and reliability engineering. He has written many papers and articles on quality and reliability engineering and management, and he lectures at universities and other venues on these subjects. In 1984 he won the Allen Chop Award, presented by the American Society for Quality, for his contribution to reliability science and technology. He is the author of the book "The Practice of Engineering Management," which describes the modern approaches to managing engineering, based upon the teaching of Peter Drucker. The book was published by John Wiley in 1994.